A basic gameplay guide. Read this if you're just getting started. 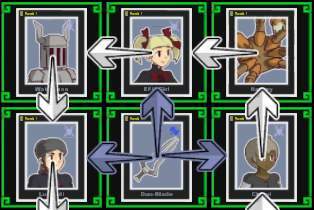 Building a stat chain is the main game mechanic. A chain can be built in a few minutes, or it can take an hour or two. You'll progress through the game either way, but a stronger chain will give you better results. 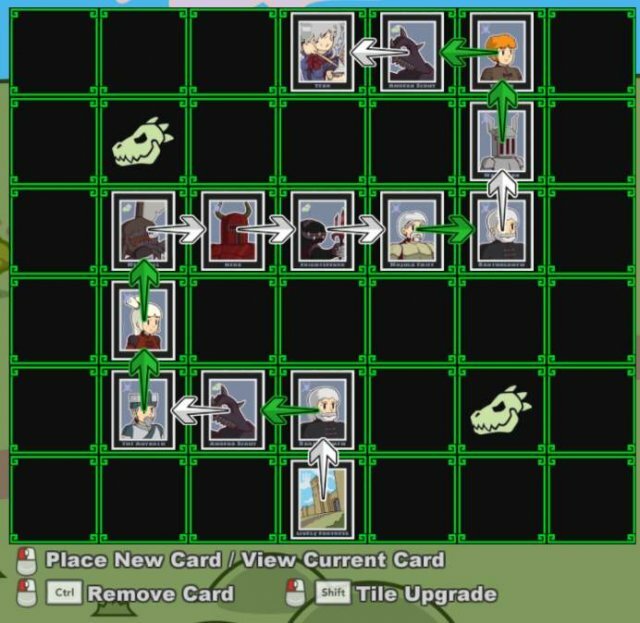 Click on the tile that has a castle icon and place a foundation card. Click on the tile that has a crown icon and place a hero card. Use your support and monster cards to connect your foundation card to your hero card. Do you see the arrows on each card? LOOK at them. 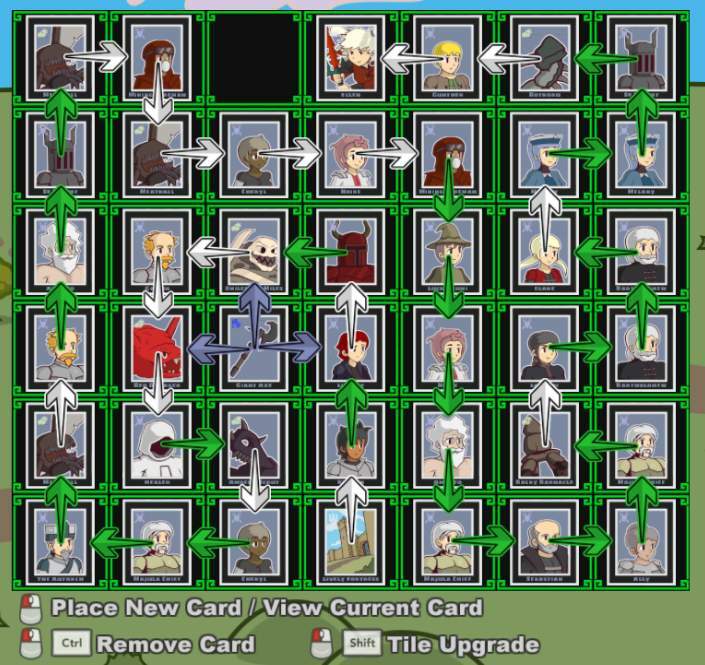 Do you notice how they start with the foundation card (the card at the very bottom), and form a line to the hero card (the card at the very top)? That's a complete chain. That's what you need to build. There's some extra cards in the chain, but it's still not very complex. There's also a few active link boosts (the green arrows). Those will be explained in the next section. As you draw more cards, you'll gradually fill in the entire grid. Also, notice the item card near the center of the grid. It's the card with the blue arrows around it. Item cards don't fit into the stat chain. Instead, they sit beside it, and boost cards that have stats that match their own. Link boosts and nulls don't effect other boosts or nulls. They also don't effect hero cards. Item cards don't effects link boosts or nulls. They also don't effect hero cards, foundation cards, or each other. Inside the game, on the main left menu, there's an option titled "Gameplay Advice". Just about everything you could want to know about the game is explained inside. This value appears in both of the stat summaries. It acts as a multiplier that benefits all of your experience values as well as upgrade and draw tokens. If your draw token stat is at 20, and your difficulty mod is at 5, then you'll actually gain 100 draw tokens each time you defeat a monster. 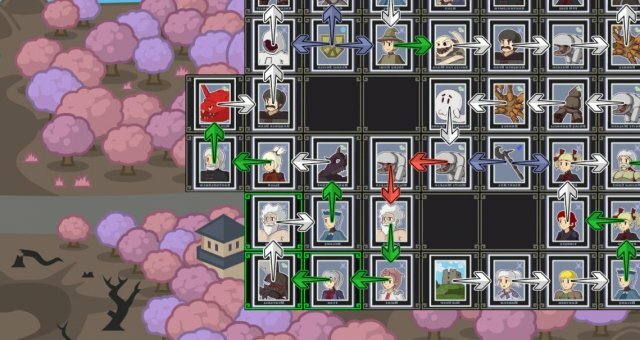 Difficulty mod increases when you move to higher ranks or harder regions. Next to your hero's HP, you'll see a value in parenthesis. This is their energy. While they have energy, their attack and defense will be boosted by your spirit value. If they run out of energy, you'll lose that boost, and healing and protection will stop working. Both of these stats (as well as every other stat) are explained further in the Gameplay Advice menu. You can throw something together in 5 minutes, or you can spend an hour carefully building something. Both options will lead to success, but the more thorough you are the more successful you'll likely be. When you have the card inventory open, you can use the arrow keys to quickly select a directional filter. 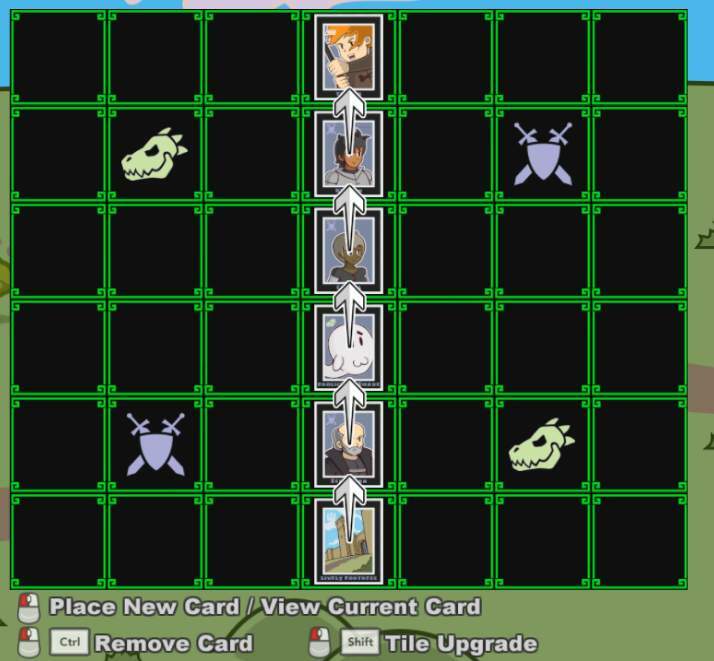 If you've opened the inventory through the battle grid, you can press Tab to enable "Chain Card Mode". This will cause the latest card in your chain to appear in your inventory so you can quickly view its stats. Under the Alt. Sorting filter, there's a "Link Boost (Chain Card Boost)" option. Clicking this will enable chain card mode, and if the latest card in your chain is a support card, all cards will be sorted by its link boost value. So if your chain card has a link boost for attack, cards will be sorted by their attack stat. If you're looking to place an item card, you can use Grid View (from the main left menu) to see which cards have which stats on them. If you have a weapon card with attack on it, enabling Attack Chain will let you quickly find which cards have attack on them (either look for a color change, or follow your chain until the number increases). These are explained in full under the Help section in the Region Select Menu. The short explanation is: Upgrade Residue gives you an attack and upgrade token boost when you start a new region. The value is based on your highest card upgrade level. Magic Residue gives you an experience boost based on your stat enhencements levels plus enhancement casts. Boss Hunter Bonus boosts a wide range of stats based on how many bosses you killed in the previous 5 regions. In the card inventory, under the Alt. Sorting filter, there's an option called Core Stat Mode. Enabling this will let you see the core values that determine how powerful a card's stat are. Tier 10 is the highest and is very rare. Tier 1 is the lowest and is very common. If you select a stat from the stat filter, all cards will be sorted by the tier value of that specific stat. Several other ways to enable core stat mode will appear once you've drawn 50 cards. If you play the game long enough, you'll unlock a feature called Card Overwrite. This will let you move stats from one card to another. You can move a tier 10 stat from that seemingly useless rank 1 card to a high rank card that you're currently using. When you fuse a card to a new high rank, all cards drawn in the future can appear at that new high rank. So if a card reaches rank 2 for the first time, all newly drawn cards have a chance to appear at rank 2. When you reach rank 3, new cards can appear at rank 3. This is actually main purpose of fusion: to increase your max card rank. Trying to fuse every single card up to a new high rank is very not ideal. It's best to focus on getting one card to a new high rank, then as you draw new high rank cards, replace all of your low rank cards. This is how I personally play the game. You're not required to play exactly like me, but it might help. When you first start, building a super efficient chain isn't that important. Simply adding more cards to your chain is the fastest way to progress. If you're patient, you can wait to buy basic booster packs. If not, drawing random card types works too. You should try to activate link boosts when possible, but it's not too important early on. At least try to avoid link nulls. 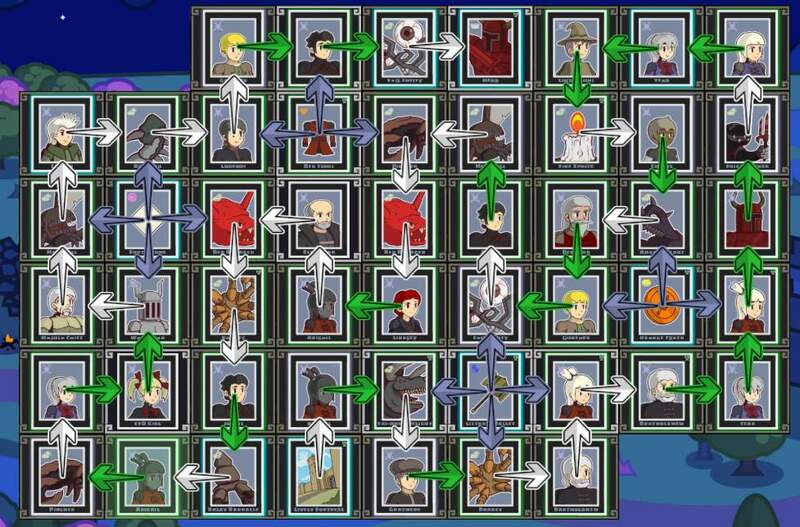 For rank points, I always put 1 into automation because I don't want to babysit the game. Afterwards, I get draw tokens, combat experience, and reclamation experience. You'll eventually end up with several hundreds of rank points, so it's ultimately not too critical. Region select is the prestige mechanic, and it unlocks at reclamation level 5. Once it's unlocked I usually buy all upgrades, cast several stat enhancements (read the help section in the region select menu to understand why), then push as high as I can go before selecting a new region. I generally let the game idle, so I go for idle mode 2 to 4, depending on how busy I am. Selecting idle mode 1 might be viable if you're actively watching the game. When it comes to tile upgrades, your hero card tile is likely the best option, then your foundation card tile and any item cards you might be using. After that there's probably not a huge difference between tiles, as long as something is being upgraded. For bless prestige, bless draw and bless grid are usually my highest, while all the others are about equal. Card fusion unlocks when you defeat the rank B+ boss. At this point I start putting my rank points into rank experience while saving up cards. Once I have a full grid plus 30 or so extras, I rebuild my chain (not required, but it helps), then use the stat enhancement for fusion and fuse all of my unused cards into my hero card. Getting a card to rank 2 means all newly drawn cards can appear at rank 2. Card sacrifice unlocks after defeating 18 bosses. After getting a rank 2 card, I usually put a few points into sacrifice experience (rank point upgrade) while replacing all of my old rank 1 cards with newly drawn rank 2 cards. The low rank cards are then sacrificed. Remember there's a stat enhancement for sacrifice. Save up cards, fuse my hero card up to a new high rank. Replacing old cards with new high rank cards. Sacrifice old low rank cards. There are rewards tied to spending time in each region. I usually spend 24-48 hours in a region (enough to get 1 to 2 rewards), then change to a new region and rebuild my chain. Firstly, you should return to the advice section and read about Core Stat Mode. Secondly, you need Card Overwrite. This unlocks after defeating 33 bosses. Until then, it's best to focus on learning the other parts of the game. The tier value, which determines the base stat value. The rank of the card the stat is attached to, which acts as a multiplier. The stat's sacrifice level, which is another multiplier. You'll first need a recipient card. This should be a max rank card. If you're looking to create a support card, you'll want it to have a strong link boost, since boosts are the only stat that can't be changed. Having high scales or high tier stats will save you time and resources, but it's not required. When drawing cards, it's usually a good idea to turn on core stat mode so you can find which stats have good overwrite potential. Tier 8 and Tier 9 stats are solid, but depending on how patient you are, you may wait for tier 10 stats. There's also a rare and expensive bonus chance that will max out a stat. When you're looking for stats and scales, the rank of the card is not important. That's because the source card will be destroyed when you use card overwrite. A tier 10 stat that's moved from a rank 1 card to a rank 5 card will continue to be a tier 10 stat. Another thing to look for is compound stats. For support and monster cards, 3 points is the highest value. For item cards, 4 points is the highest. If your recipient card doesn't have strong scales, you'll need to find cards with those as well. A high rank recipient card. If it's a support card, you'll want a strong link boost. Cards of any rank whose stats have high tier values. Cards of any rank whose compound stat has 3 or 4 points. Cards of any rank with strong scales. When using card overwrite, you can move one stat from a source card (your cards with high tier stat values) to the target card (your high rank recipient card). The source card will then be destroyed. If you want a card with perfect stats, you're going to need quite a few source cards.